Beach at Point de Galle. bl.uk > Online Gallery Home	> Online exhibitions	> Asia, Pacific and Africa Collections	> Beach at Point de Galle. 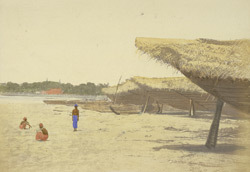 Photograph by Frederick Fiebig from an album of 70 handcoloured salt prints, with showing the beach at Point de Galle in Sri Lanka (Ceylon). Frederick Fiebig was originally an artist and lithographer in Calcutta in the 1840s. He took up photography in ca.1849 and in the early 1850s produced nearly 500 calotypes of the architecture and scenery of Calcutta, Madras, Sri Lanka, Mauritius and Cape Town. ‘Views in Sri Lanka’ comprised 70 prints which were purchased by the East India Company in 1856. Galle, on the south-western coast of the island, has a natural harbour and is one of the most ancient settlements of Sri Lanka, a port from pre-Christian times. It is protected by a promontory called the Rock or Galle Point. Galle was the main port of the island even though entrance to its harbour was dangerous because of submerged rocks and reefs, until supplanted in the 1870s after the construction of breakwaters in the development of Colombo's harbour. The Portuguese arrived in the early 16th century and built a small fort here, but it was after Galle was captured by the Dutch in 1640 that it achieved its greatest prosperity. The English replaced the Dutch in 1796 but made few changes to the town and today it is the surviving Dutch architecture of the 17th and 18th centuries which lends Galle its charm.